Takes 4 minutes to read. Too busy right now? Save it and read it later! In the minds of many agencies, deliverables are what it’s all about. However, what matters to clients usually takes place long before and after an agency deploys their code or emails their designs. Use the Smiling Curve to uncover that value. The insight that value, as perceived by customers, isn’t evenly distributed along the so-called value chain is often illustrated using a Smiling Curve. The Smiling Curve is an invention by Stan Shih, founder of Acer. Back in 1992, when Shih came up with the idea, Acer wasn’t a very known brand. Shih was wondering what Taiwanese companies, like his Acer, could do to command the prices that American brands did. His insight was that the things that commanded most value in the eyes of consumers were at the beginning and the end of the value chain. In Shih’s industry, these ends are conception and marketing. Shih applied these insights in successfully repositioning Acer from being an unknown manufacturer to being a well-known PC and technology brand. The Smiling Curve was born. Initially, the smiling curve was intended for the manufacturing industry. However, a similar curve can also be made for the IT service industry. In the book “Implementing Value Pricing“ by Ron Baker (see the right side for links), a smiling curve for IT firms is provided. 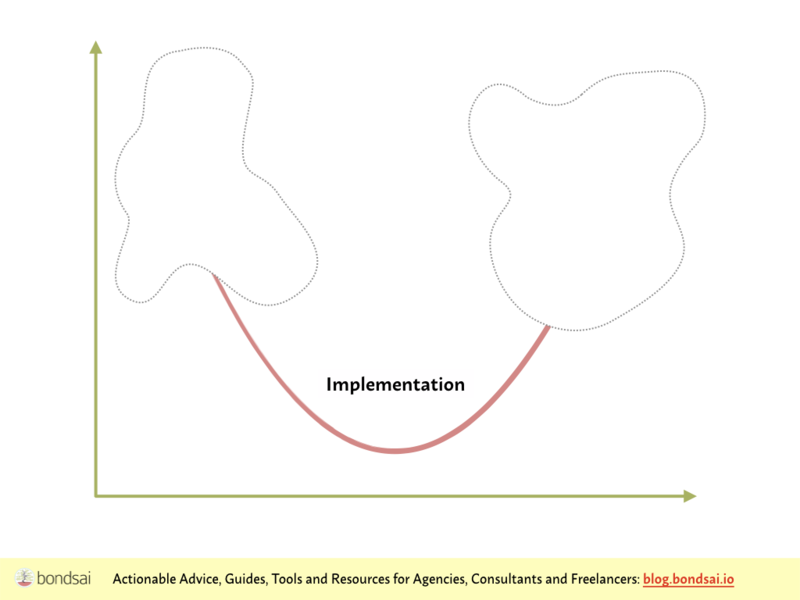 If I asked what department or office in your company that provided “implementation” I’m sure you could answer it immediately. However, if I asked about the high-value items in the chart above, “determining value to solve” and “ongoing support,” chances are high you would hesitate. Fact is, many agencies pay way too much attention to the things that customers value the lowest. 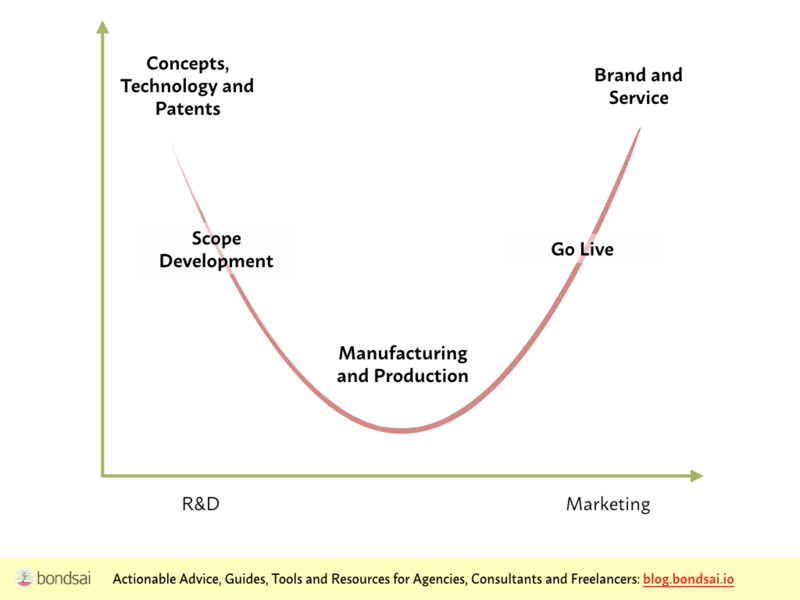 Now the labels on the smiling curve above are generic and may not apply to your specific industry. Even so, the model holds as multiple case studies have shown. What’s even more interesting is that the curve seems to deepen. The production of services and goods is getting less and less value-bringing compared to conceptualizing and marketing them. The Smiling Curve is an excellent tool for identifying activities that can bring even more customer value and fetch higher prices. To make this more concrete and actionable, I urge you to draw a smiling curve for your company and populate it with your data. The critical point here is “data.” Not guesswork but actual feedback from real, living customers. Are you providing the highest possible value to your customers? If not, what products and services could you provide with your current, or adjacent and easily obtained, skill set? In other terms, your job is to fill those white spots on the map that take place outside of where you put your focus right now. Interview clients. Meet them over lunch and pick their brains. Ask open questions and aim to understand what worries and excites them. Many companies have come up with their solutions to common problems that irk them frequently. Organize a client retreat. Invite a group of clients to a day of learning and sharing of experiences. Bring in speakers and use the opportunity to learn more about your clients’ challenges and where you can be of help and service. If a retreat sounds too ambitious, invite clients for dinner. Wine and dine them and provide an empathetic ear in learning about how they view the world. Don’t justify or pitch your ideas or solutions. Instead, ask open and honest questions about their challenges. If you want to organize something in your office, invite them to a workshop. Many will probably decline as they will rightly assume it’s another sales effort. Key here is to make the theme and topic something that is truly relevant to them. This will require some prior research. However, well done, it could be a fantastic opportunity to learn about their needs as well as showing your consulting skills in solving problems together. Using a survey. It won’t result in as much information as interviewing but if you focus the survey on one topic or area, you’ll get a lot of information with relatively little effort. Logging all interactions with customers and potential customers. Then follow up and trying to understand: Why does this customer contact me? Why now? What are the causes? Is there a trigger? Interviewing customer support and sales staff. They are the most knowledgeable at a company when it comes to customer needs. Stefan says they might even know more about the customers than the customers themselves. This knowledge is usually not structured and sometimes tacit and hard to convey formally. In many technology companies, the engineers rule, not market and sales, Stefan adds. 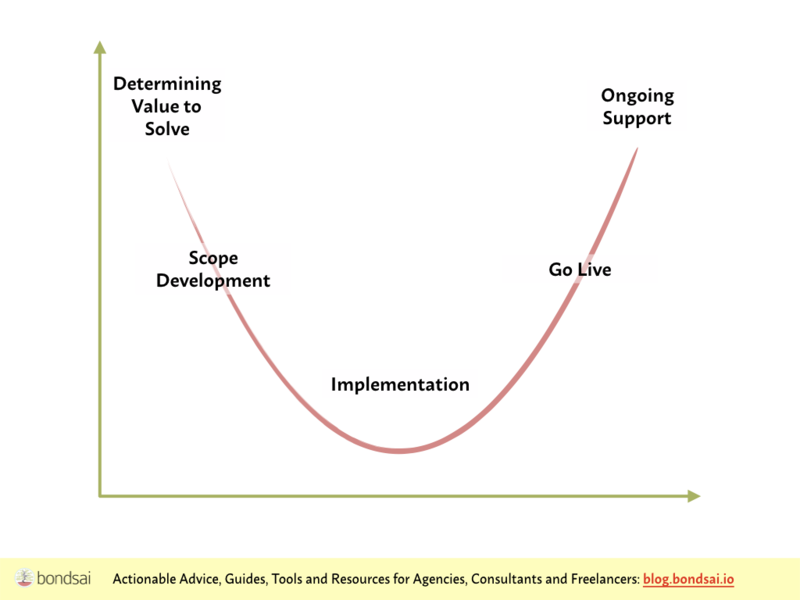 The smiling curve illustrates what your clients value and where you can do the most for them. By mapping the value chain and determining the value provided at each point, you can discover opportunities for innovation. It helps you create new valuable products and services that solve real, painful and immediate problems for your clients. What things do you think you could do for your customers in addition to what you’re doing now?